EMISSIONS EMERGENCY All sources agree that global emissions must decline rapidly from 2020, including the 2018 IPCC 1.5C Report. IPCC 1.5C confirms that 1.5 degrees C (by 2100) is the survival limit. Global emissions for 2018 was another record high. National emissions targets (2018) lead to a substantial INCREASE in emissions by 2030 projected to cause a catastrophic warming of 3.2C by 2100 (Climate Action Tracker). The US Trump Republican administration is boosting production of America's enormous fossil fuel deposits to the maximum. Canada's tar sands mining continues to expand. China is building more coal plants in and outside of China (Coalswarm). GHG POLLUTION EMERGENCY Greenhouse gas pollution indicators and direct effects are all increasing fast (StateofOurClimate.com). The 2015 UN Paris Agreement is not working A May 2016 Update of national emissions targets (May 2016) projects global emissions will be 16% HIGHER in 2030. There has been improvement in the national emissions targets (August 2018). Reuters 23.6.2015 Climate change health risk "medical emergency", experts warn. 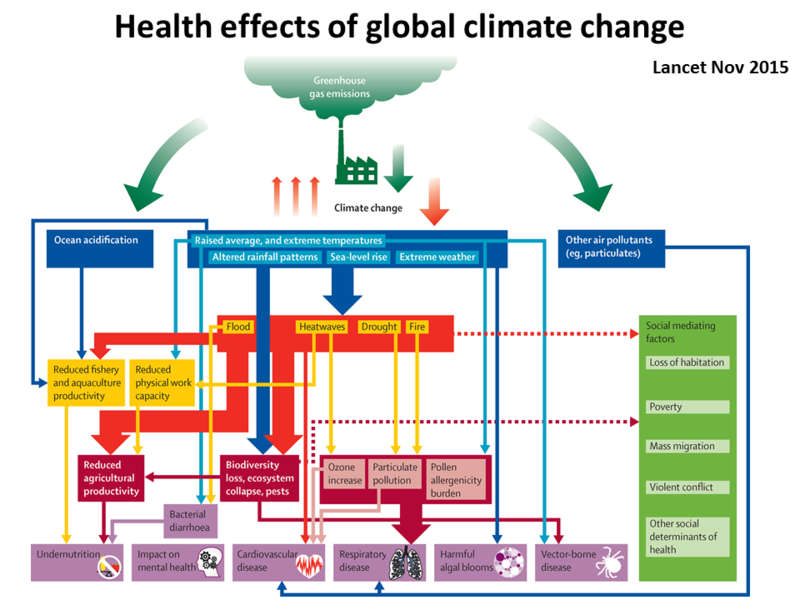 For full report: Lancet report Health and climate change: policy responses to protect public health. May 2015: World Medical Association urges doctors to advise their governments (this year 2015) that climate change is the greatest global health challenge of the 21st century. Write to governments urging them to terminate fossil fuel subsidies, which are US$Trillions/yr (globally IMF 2015) and to cost fossil fuel pollution. These obvious market failure correction measures have been approved for years by the G8, the IMF, World Bank, OECD, and International Energy Agency. The charts below show conclusively that the world is in an extremely grave state of climate change planetary emergency. Below is from the WMO Greenhouse Gas Budget. Atmospheric CO2 is now 408 ppm (Scripps). Today, the only climate or energy plan that the world has is suicidal. Atmospheric greenhouse gases are increasing faster than ever, at an unprecedented rate (see Our Climate). The series of GHG graphs above shows our dire emergency situation. Today's atmospheric GHGs are far above their 800,000 year maximum, have abruptly increased from 1900, and CO2 is still accelerating. National medical and health organizations can make a great difference by writing to their national governments. We would, of course, like all medical and health organizations to declare the global climate change and ocean acidification planetary emergency. The emergency is all the more more dire because GHG emissions are at record highs, and there are no international policy plans in place to change this. Below is the last EU report on emissions (by their source) and the US EPA record of global emissions (by gas). Fossil fuel CO2 emissions increased to a new record high in 2017 (IEA). Climate change is set to inflict "severe, widespread, and irreversible impacts" on people and the natural world unless carbon emissions are cut sharply and rapidly (IPCC statement Lima UN climate conference 2014). Yet the World Medical Association, in urging governments to act, noted that the December 2014 COP20 negotiations in Lima, Peru made little progress. "As negotiators look toward Paris, it is imperative that governments commit to addressing the devastating health implications of unmitigated climate change," said Dr. Haikerwal, Chair of the WMA Council. The Paris Agreement demoted Kyoto national emissions commitments to non-binding target intentions (INDCs). "Declare global climate change a global public health emergency"
"Climate change & the carbon-intensive economy are responsible for 5 million deaths each year"
"WE HAVE REACHED A POINT OF PLANETARY EMERGENCY...."
The situation for our future is now critical. Negotiations have led to the 2015 Paris Agreement but as of May 2016 global emissions are projected by the UN to be 16% HIGHER by 2030. All energy plans are for continued fossil fuel dominance and dependence. There is no international plan to put emissions into rapid decline. World fossil fuel subsidies are $Trillions a year (IMF 2015) and there is no plan for global price on carbon. Atmospheric CO2 is the highest it has been in 3-5 million years, increasing at an unprecedented rate (IPCC 2007, 2014 ) and now faster than ever without past precedent (WMO 2017). Atmospheric methane is over double its 800,000 year maximum, (ice core data) now increasing fast. Extreme weather events and drought — affecting crop yields — are increasing, including in the Northern hemisphere. Ocean acidification is accelerating, increasing faster than in the past 300 million years (Hönis ; see References), by atmospheric CO2. We are absolutely committed (locked in) to a warming of 1.5ºC by 2100 due to climate system inertias (IPCC AR5). We must declare the planetary climate change emergency. We must prepare for the worst ever environmental and population health calamity — of unprecedented proportions. Many warnings have been issued, but it is going to take enormous pressure to persuade governments, intent on supporting further fossil fuel energy expansion, that an emergency response is imperative for our future survival. "Climate change is the biggest global health threat of the 21st century." "Human-induced climate change requires urgent action." "In the face of an absolutely unprecedented emergency, society has no choice but to take dramatic action to avert a collapse of civilization." "The last decade was the hottest on record. The world's best Northern Hemisphere food-producing regions have experienced episodic severe heat, drought and extreme weather events that have damaged crops. "In most countries there is a discernible reduction in crop yield trends due to climate change." All Arctic carbon feedbacks are now kicking in. Carbon feedbacks are, by definition, the most dangerous effect of global warming because they boost global warming further. The Arctic is switching from carbon sink to source (NOAA Arctic Report card 2016) The Arctic contains massive vulnerable pools of carbon. "Global climates only slightly warmer than today are sufficient to thaw significant regions of permafrost." Siberian permafrost has a tipping point of a 1.5ºC global warming. Analyses by the Climate Interactive Scoreboard and Climate Action Tracker show that current unconditional national 'intended' emissions reduction targets commit the world to a 3.2ºC temperature increase by 2100, which is a commitment to much higher warming long after 2100 (due to inertia of the ocean heat lag). There is still no formal acknowledgement of the climate change emergency or that the world is beyond dangerous interference with the climate system (1992 UN Framework Convention on Climate Change). The latest UN climate conferences have led to the UN Paris Agreement , which includes various 'intended' national emissions reduction targets but no binding commitments. "The potential for runaway greenhouse warming is real and has never been more clear." Global climate change and other ongoing persistent global environmental problems "threaten humanity's very survival.... The need couldn't be more urgent ... to act now to safeguard our own survival and that of future generations." "Effects of climate change on health will affect most populations in the next decades and put the lives and wellbeing of billions of people at increased risk." "Unless decisive action is taken now, the world will face global public health and environmental catastrophe. We believe that the health and healthcare community can, and must, spearhead a major movement for change." "If there's no action before 2012, that's too late. What we do in the next two to three years will determine our future. This is the defining moment." We are tracking close to the worst case global emissions scenario (2017) headed for over four degrees of global warming by 2100 and much higher long after 2100 , which constitutes a climate change planetary emergency and a threat to the very survival of humanity. the IPCC's worst case scenario. Doctors and concerned professionals in other leading institutions have a vital role to play in safeguarding future generations from planetary catastrophe — but only by acting today. Why healthcare professionals? The medical community is in a special position to respond to this crisis. There is no profession better qualified to understand the huge risks humanity is running, to define "dangerous" climate change, and to prescribe the best remedial measures for diminishing the disaster and preventing total climate catastrophe. The declaration of this planetary climate change emergency and summons to a global emergency response would naturally come first from these professions. Only an international declaration of a state of global climate change emergency can rapidly rectify this situation, by leading to a concerted international emergency response to rescue all future generations. It is CLIMATE CHANGE EMERGENCY MEDICAL RESPONSE's mission to help concerned professionals (especially doctors) contribute to remedying this situation, and to link with support from other concerned citizens. Why the urgency? In short, all indicators are increasing fast and the most vital ones are accelerating (StateofOurPlanet.com). the level of carbon dioxide in the atmosphere still accelerating at an unprecedented rate at a 3-5 million year high. atmospheric methane (currently 2.5 times preindustrial levels) which is over 80 times as powerful as CO2 for warming, is increasing fast. There is still no formal statement that the world is beyond "dangerous anthropogenic interference with the climate system" (UN climate convention) and no declaration of a global climate crisis or planetary state of emergency. Industrialized nations continue to block the way to any fast acting binding agreement that would prevent catastrophic global climate change. The Paris Agreement is another delay. We can [also] inform the debate with reliable data on the health consequences of global warming, and use our professional voice and leadership to instill it with urgency. a common understanding that humans are facing a dire and unprecedented planetary climate change emergency. What's the first step? Click on the Climate Change Emergency button below for immediate action steps, or on a link to the left to learn about the risks and to see how doctors and other healthcare professionals can take action on global climate change. Stalled UN climate negotiations mean no new treaty is on the way, heightening the climate emergency. Just as doctors seek evidence when making a diagnosis, this page links to evidence of the climate change emergency for health professionals who want to learn about their role in mitigation. State of the Climate is a research summary on methane emissions and other carbon feedbacks, especially in the Arctic, which threaten life on Earth. Defining dangerous climate change impacts and risks in terms of threats to human population health and survival is something the health care profession is qualified to do. Climate science includes essential aspects of global climate science to explain why today's global warming is twice what we think it is. EMERGENCY ACTION is a one-stop webpage for doctors and other health care professionals who want to respond to the climate change emergency. Here is abundant evidence showing why climate change is an emergency and an increasing threat to the very survival of humanity. The biggest health risk of global climate change will be its impact on food security, yet climate models don't include all the adverse effects of climate change on agriculture. Although the 2 degree target for global warming is now almost a universally accepted policy position for global climate change mitigation, it is disastrously high! These excerpts from the UNFCCC (the United Nations climate change convention) highlight the intersections between climate change, health and policy. This page lists global warming and climate change solutions for health professionals to promote. We call on our healthcare, other professional associations, religious and our governments to make a climate change emergency declaration on behalf of present and future vulnerable populations. The medical response to climate change is growing. Medical associations, medical journals and medical researchers are starting to focus on the impacts of climate change on human and population health. Climate change emergency links to educational and action websites on the greatest threat ever. Follow-up is a list of ways that doctors and other healthcare workers can disseminate and teach what they have learned about the global climate change emergency. The mission of Climate Change Emergency Medical Response is to provide a one-stop resource on the planetary climate change emergency and remedial action. This climate change emergency references page lists the citations of research studies on the current state of the climate and why it is heading to climate catastrophe. Check out these climate change emergency updates on a regular basis, to see what's new in the science of global climate change. This is a site map of Climate Change Emergency Medical Response.org.